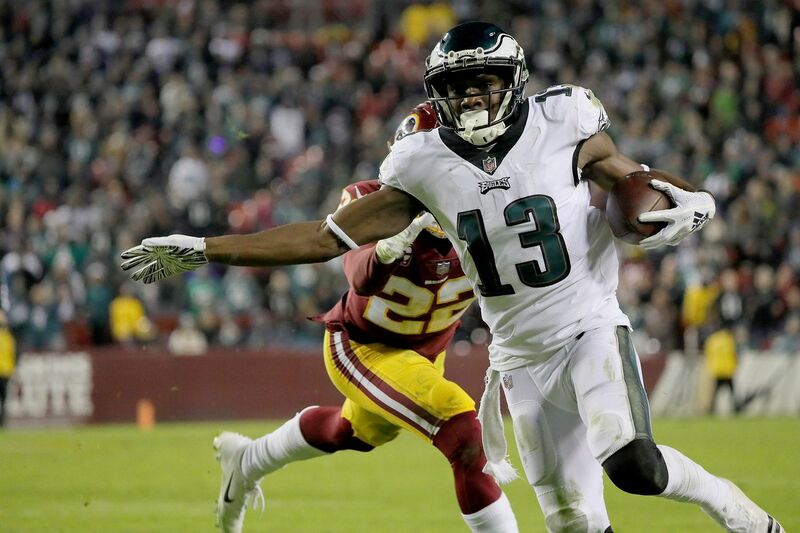 Nelson Agholor scores past Washington defensive back Deshazor Everett in the fourth quarter. The Eagles' first-round playoff game against the No. 3 seed Chicago Bears will kick at 4:40 p.m. ET (3:40 p.m. local time) on Sunday. The game will air on NBC, and Al Michaels and Cris Collingsworth will be in the booth. Eagles-Bears follows a 1:05 p.m. matchup between the No. 5-seed Los Angeles Chargers and No. 4-seed Baltimore Ravens. That game will be on CBS. On Saturday, the No. 3-seed Texans will face either the Colts or the Titans, depending on which team wins Sunday night’s game, at 4:35 p.m. on ABC. And at 8:15 p.m. Saturday, the No. 5-seed Seahawks will travel to face the No. 4-seed Dallas Cowboys in the other game. That will air on Fox.